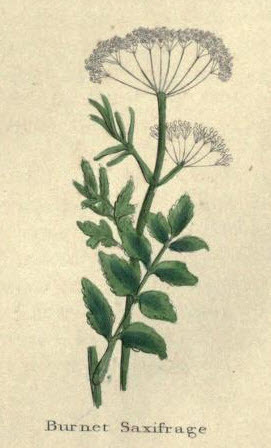 Pimpinella Sanguisorba. The great wild Burnet hath winged leaves rising from the roots like the garden Burnet, but not so many; yet they are twice as large, and notched in the same manner about the edges, of a greyish colour on the under side; the stalks are greater, and rise higher, with similar leaves, and greater heads at the top, of a brownish colour, and out of them come small dark purple flowers like the former, but larger. The root is black and long like the other. It has very little scent or taste. The first grows in gardens. The wild grows by waysides, and in dry places. They flower in June and July. It is a most precious herb, little inferior to Betony. The continual use of it preserves the body in health, and the mind in vigour. It is a friend to the heart, liver, and other principal parts of a man's body. Two or three of the stalks, with leaves put into a cup of wine, especially claret, are known to quicken the spirits, and drive away melancholy. It is a special herb against infection, the juice being taken in some drink, and the party laid to sweat. It has also an astringent quality, and will stop fluxes of blood or humours, staunch bleedings inward or outward, women's too-abundant courses, the whites, and the choleric belchings of the stomach. It is a good herb for all sorts of wounds, both of the head and body, either in�ward or outward, used either in juice or decoction, or by powder of the root, or distilled, or made into an ointment.